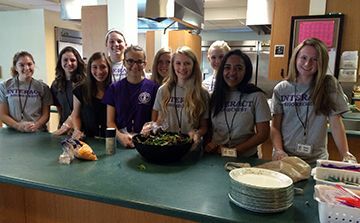 On February 8, ten members of Interact met at the Ronald McDonald House to host a delicious Italian lunch. Thanks to the donation of Dominique R., whose family owns Mazzaro's and supplied 3 trays of lasagna, and other students who donated salads, desserts and drinks. The families were very appreciative and the students really enjoyed raising their spirits!